Commerce at the Crossroads. —. . Intersection of Rivers and Roads . Imagine traveling hundreds of miles in an ox-drawn wagon along muddy, rock-strewn, deeply rutted roads through the wilderness. In search of new homesteads, early settlers followed the same routes you took to get to Vergennes. Old stage roads, now US Route 7 and Vermont Route 22A, merged on Main Street. In addition, Otter Creek was a main travel route in the 1800s, as the basin below the falls grew into one of nearby Lake Champlain's busiest ports. Later, in 1848, the Burlington and Rutland Railroad arrived at Vergennes, providing a faster mode of travel. An Early Vermont Hub . Chartered in 1788, Vermont's first city capitalized on the falls, access to Lake Champlain, and its location at a crossroads to attract people and businesses. Vergennes, which covers about 2 square miles (1,200 acres), grew during the 1800s as a manufacturing, trade, and cultural center for the surrounding agricultural towns. Farm Trade in the City . Farmers from nearby towns brought grains, milk, wool, and other raw materials to sell or trade in Vergennes. The red brick Norton Grist Mill, built in 1878 to replace an earlier grist mill on the island, served the farmers. It used water power to drive large grindstones and produce flour, grain, feed, and plaster for over 90 years. Teams of horses driven to the mill were watered, fed, and rested in the nearby barn. Imagine traveling hundreds of miles in an ox-drawn wagon along muddy, rock-strewn, deeply rutted roads through the wilderness. In search of new homesteads, early settlers followed the same routes you took to get to Vergennes. Old stage roads, now US Route 7 and Vermont Route 22A, merged on Main Street. 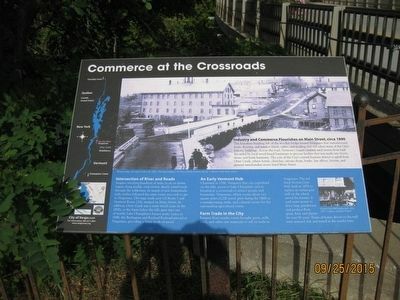 In addition, Otter Creek was a main travel route in the 1800s, as the basin below the falls grew into one of nearby Lake Champlain's busiest ports. Later, in 1848, the Burlington and Rutland Railroad arrived at Vergennes, providing a faster mode of travel. Chartered in 1788, Vermont's first city capitalized on the falls, access to Lake Champlain, and its location at a crossroads to attract people and businesses. Vergennes, which covers about 2 square miles (1,200 acres), grew during the 1800s as a manufacturing, trade, and cultural center for the surrounding agricultural towns. Farmers from nearby towns brought grains, milk, wool, and other raw materials to sell or trade in Vergennes. The red brick Norton Grist Mill, built in 1878 to replace an earlier grist mill on the island, served the farmers. It used water power to drive large grindstones and produce flour, grain, feed, and plaster for over 90 years. Teams of horses driven to the mill were watered, fed, and rested in the nearby barn. The four-story building left of the wooden bridge housed businesses that manufactured doors, flooring, and window blinds, sashes, and molding that still adorn many of the City's historic buildings. Across the road, Vermont's largest tannery used tannin from bark discarded by local wood-based businesses to process leather that was made into boots, shoes, and horse harnesses. The core of the City's central business district is uphill from Otter Creek, where hotels, churches, artisan shops, banks, law offices, liveries, and general merchandise stores lined Main Street. Location. 44° 9.983′ N, 73° 15.36′ W. Marker is in Vergennes, Vermont, in Addison County. Marker is on Main Street (Vermont Route 22A), on the left when traveling north. Touch for map. Marker is in parking lot for building at following address: 300 Main Street, Vergennes, Vt. Marker is in this post office area: Vergennes VT 05491, United States of America. Touch for directions. Other nearby markers. At least 8 other markers are within walking distance of this marker. The Vergennes Pump House (within shouting distance of this marker); Early Life Along Otter Creek in Vergennes (within shouting distance of this marker); World War Memorial (about 800 feet away, measured in a direct line); The Bixby Memorial Free Library (about 800 feet away); Vergennes 150th Anniversary (approx. ¼ mile away); Commodore Thomas Macdonough (approx. ¼ mile away); Veterans Memorial (approx. ¼ mile away); Macdonough Shipyard (approx. ¼ mile away). Touch for a list and map of all markers in Vergennes. More. Search the internet for Commerce at the Crossroads. Credits. This page was last revised on June 16, 2016. This page originally submitted on September 28, 2015, by Bill Donovan of Maplewood, New Jersey. This page has been viewed 212 times since then and 3 times this year. Photo 1. submitted on September 28, 2015, by Bill Donovan of Maplewood, New Jersey. • Bill Pfingsten was the editor who published this page.